Chandeliers and decorative fixtures are delicate and can be difficult to clean properly. Environmental contaminants including dust, condensation, chemical & water residue from past cleaning can dull crystals. Stuart Dean can clean your chandeliers using our exclusive, patented Advanced Directional Atomizing Cleaning (ADAC) system. What are the ADAC benefits? Speed – Our process is 3x faster than traditional hand-cleaning methods. Effectiveness – Our chemical-free system, using de-ionized, reverse osmosis water combined with heat, ensures your fixtures are spot-free. 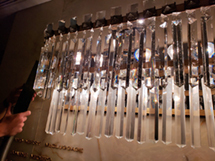 Touch-Free – Crystals remain on the fixture and are only gently manipulated during the cleaning. Non-Intrusive – Work is scheduled during off-hours, meaning a minimal disruption to day-to-day operations. The work is generally confined to an area not much larger than the footprint of your chandelier. Stuart Dean will let the light shine through your newly cleaned crystals. 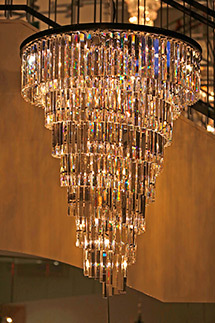 This image shows a crystal sconce in the process of being cleaned. The top row of crystals have just been cleaned and the bottom row will follow. The reverse osmosis, de-ionized water used in the process will dry spot-free. Stuart Dean offers the highest level of expertise in the industry. We ask the right questions, uncover the root causes, and apply state-of-the-art methods for the right solutions.